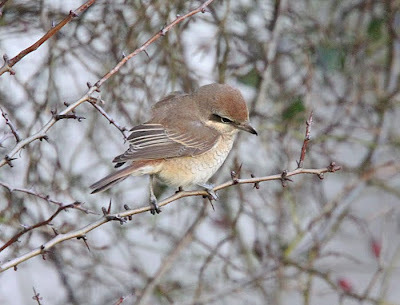 The ASIATIC BROWN SHRIKE was proving typically popular and arriving just after 1210 hours, I met Lester Mulford and his sister (sadly his mum of 105 years of age passed away just recently), Ron & Simon King, Steve Webb, John Dixon, Franko & Oliver, Dave Morris, Ian & Chris Williams, Gary Howard & family and Peter Alfrey amongst others. The footpath down from Hithermoor Road is still incredibly muddy, despite the ice, and it remains a challenge to get to the boardwalk without getting totally caked in mud. I did finally make it relatively unscathed and for about five minutes enjoyed good views of the long-staying Asiatic vagrant as it moved along the Hawthorns bordering the east side of the river. It had been feeding on earthworms on the ground in the sparsely vegetated area on the left just after the boardwalk and showing very well but after being the centre of attraction for several hours, decided to revert back to its skulking nature and disappeared at about 1300 hours (and failing to reappear in the next two hours). 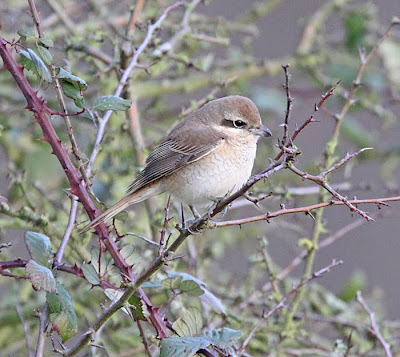 Andrew Moon had managed to get these superb images of the bird just prior to its disappearance on 18 December and shows how much buff on the underparts the bird now has acquired.